Granted, Apple set themselves up for a measure of such abuse by introducing the Hi-Fi as an “audiophile”-grade system that will “redefine” the home stereo system, when it’s really a bookshelf-style speaker system—albeit one that can run off batteries—that attempts to improve on some of the more popular existing systems on the market. These include Bose’s $300 SoundDock, Klipsch’s $280 iGroove, ZVOX’s $300 (with bag and battery) ZVOX mini, Tivoli Audio’s $330 iSongBook, or even Altec Lansing’s $250 inMotion iM7 and Cambridge SoundWorks’s $200 PlayDock MP3. (XtremeMac has also announced a similar system, the $200 Tango.) But how does the Hi-Fi actually stand up against the competition, and is it worth the price tag? After spending a few days with one, it’s time to give you the full run-down. 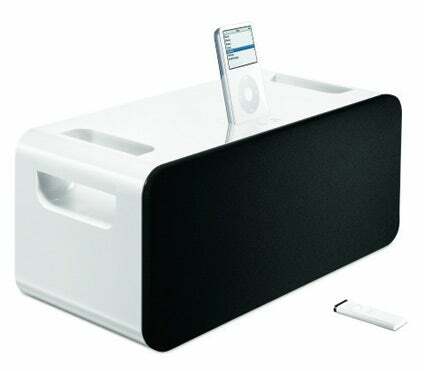 The top of the Hi-Fi hosts Apple’s Universal iPod dock cradle; 10 adapter inserts are included for compatibility with all current and previous dockable iPods. In front of the dock are touch-sensitive up/down volume pads. Although this top-mounted dock design allows for quick docking/undocking and keeps the iPod’s screen accessible and visible, it also makes it more difficult to pick up and move the Hi-Fi—you have to worry about the iPod falling off—and it means that if you want to put the Hi-Fi on a shelf or in an A/V cabinet, you have to leave 4 to 5 inches of space above it. The Hi-Fi’s back panel provides a 1/8-inch (3.5mm) auxiliary input jack that accepts either analog or optical S/PDIF input. (The Hi-Fi includes its own digital-to-analog converter [DAC].) The back also hosts a battery door—the system can run off six D batteries—and the jack for the system’s AC cable. Note that unlike many similar systems, the Hi-Fi doesn’t require an external power brick; the power supply—an auto-switching model that supports 100-240V at 50-60Hz—is actually inside. (I also like the fact that you get a 9' 6" cable—long enough to reach from most outlets.) One prominent omission: a video output port. Given that Apple is pushing the Hi-Fi as part of your home entertainment system, a video-out port seems like an obvious feature that would allow you to view your iPod-hosted photos and videos on your TV. 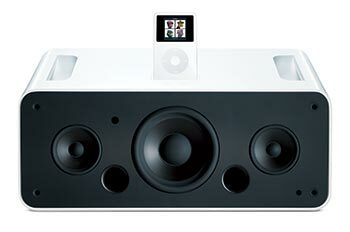 (Apple told Playlist that the Hi-Fi is designed to take the place of a home audio system, not a home theater system. In addition, the company pointed out that you can still get video from the AV [headphone] jack on video-capable iPods; the drawback is that this is a composite video jack vs. the higher-quality S-Video signal of the iPod’s dock connector.) The Hi-Fi also does not include a dock-connector port for connecting a docked iPod to your computer for syncing, but since the system is clearly not designed to be used on a computer desk, it’s hard to fault it for this omission. Finally, behind the front grille are the Hi-Fi’s speaker drivers: two 80 mm wide-range drivers—designed to take the place of separate midrange and tweeter drivers—in sealed enclosures, along with a 130 mm, dual-voice-coil, ported woofer in a larger overall enclosure; the woofer’s two ports are clearly visible with the grille removed. The speakers are powered by a built-in Class D amplifier, but Apple doesn’t publish official power ratings. Also on the front of the unit are the sensor for the remote control (on the left, between the midrange driver and the woofer) and the system’s status light (in the lower-right). The grille attaches via four metal pegs that make it easy to remove and put on; with the grille off, the Hi-Fi takes on a decidedly retro appearance. The Hi-Fi includes Apple’s standard Apple Remote, featuring Play/Pause, Forward, Back, Volume Up, Volume Down, and Menu buttons. Although an infrared remote, which generally means “line-of-sight with limited range,” I’ve been pleasantly surprised by the performance of Apple’s remote, which also works with the Mac mini, iMac, MacBook Pro, and Apple’s Universal iPod Dock. (If you’ve got more than one Apple Remote-capable device, Apple recommends pairing specific remotes with specific devices to avoid accidentally controlling multiple devices with a single keypress.) Unlike most infrared remotes we’ve tested, the Apple Remote works across large rooms and at off-axis angles; I even had regular success using it from behind the Hi-Fi. My only criticism of the remote is that it would be nice to have a bit more functionality—some systems offer control over playlists or shuffle and repeat modes. Unlike Bose’s SoundDock—but similar to Altec Lansing’s inMotion iM7—the Hi-Fi doesn’t require that you be tethered to an AC outlet, since it can also run off batteries. Sturdy, built-in handles on the upper-right and -left help you move the Hi-Fi from place to place. Granted, at nearly 17 pounds with batteries, it’s not something you’re going to be carrying with you regularly, but it’s nice to be able to take it out to the patio for a barbecue. Given the Hi-Fi’s surprisingly loud output levels and impressive bass response (see below), I was curious as to the system’s battery life. Although Apple’s Web site doesn’t provide official figures, Bob Borchers, Senior Director of the iPod Ecosystem for Apple, told Playlist that you should be able to get approximately 5 hours of playback at maximum volume, with up to 15 hours at normal listening levels; as with any battery-powered speaker system, actual battery life also depends on the type of music, with bass-heavy and dynamic music requiring more power than other music types. Interestingly, the Hi-Fi includes unique circuitry to prevent the sort of low-battery distortion found in other portable speaker systems: As the batteries drain, the Hi-Fi automatically scales back the maximum volume level. In other words, you can’t turn the system up as loud with weak batteries—the system’s indicator light turns orange as if to say, “Sorry, that’s it!”—but you get clean, undistorted sound all the way to the end. Similarly, when you unplug the system’s AC power cord, causing it to run off battery power, the Hi-Fi automatically reduces volume to an “ambient” level to conserve power; you can then adjust the volume as desired. These touches are classic Apple—and I mean that in the very best way. In my testing using brand-new Duracell alkaline batteries, the Hi-Fi played at very loud volumes for two to three hours, then automatically dropped down to a lower maximum volume, where I let it continue to play. Overall, I got just under 11 hours of battery life. I should mention a couple caveats for those considering the iPod Hi-Fi for portable use: First, its glossy white plastic scratches fairly easily—this isn’t something you want to toss in your trunk. Similarly, you’ll need to be careful not to snag the fabric front grille when moving it around. (I wouldn’t recommend transporting the Hi-Fi with the grille off, as you risk damaging the drivers themselves.) Thankfully, vendors are already working on cases: WaterField Designs told Playlist that they’re working on a padded case, similar to their (much smaller) iPod Gear Pouch, that will hold the Hi-Fi, your iPod, and a few other pieces of gear; you’ll be able to carry the whole package via a handle or shoulder strap. The Waterfield case should be available in a few weeks. Physical size and battery use aside, what really sets the Hi-Fi apart from other transportable speaker systems are a number of interesting playback features. For example, a new Speakers menu appears on fifth-generation and nano iPods when you dock them with the Hi-Fi. This menu—actually present, but hidden, in these models since they were released, and updated via January’s iPod Software 1.1—provides several options specific to Hi-Fi-docking. Tone Control allows you to choose a Hi-Fi-specific EQ setting: Normal, Bass Boost, and Treble Boost; unlike the iPod’s EQ settings, the tone controls take effect in real time, so you can quickly compare the options as you scroll through them. (Note that the iPod’s standard EQ settings also appear to affect the iPod’s output when docked with the Hi-Fi; however, the Tone Control setting doesn’t affect audio output when docked with a different speaker system, nor does it affect headphone output.) Backlight lets you choose when your iPod’s screen backlight should be lit when docked in the Hi-Fi: Always On, Always Off, On Keypress, or While Playing. Finally, a Large Album Art option will display are in full-screen mode as long as your iPod is docked. The only problem with this last setting is that if a track has no album art, the screen simply goes blank; it would make more sense if the screen showed the standard informational display until another track with album art is played. The caveat here? According to Apple, the Speakers menu item and its settings are not available on older iPods; they rely on technology found in the most recent models. As I mentioned above, the Hi-Fi includes a 1/8-inch (3.5mm) auxiliary input jack for connecting another audio device via an analog or optical-S/PDIF cable. For example, you can use the Hi-Fi to listen to an iPod shuffle, a TV or DVD player, or even the output of an AirPort Express. (During my testing, I used an AirPort Express—via both analog and optical cables—to listen to music streamed from iTunes; the Hi-Fi worked flawlessly. So much so that I had to wonder if Apple considered including wireless functionality in the Hi-Fi itself; it would make a great “remote speaker” system for iTunes/AirTunes.) However, unlike many iPod-docking speaker systems, which simply mute iPod playback when a second audio source is connected, the iPod Hi-Fi allows you to switch between the two sources using the remote’s Menu button: If the iPod is playing, holding down the Menu button for a few seconds pauses the iPod and switches to the auxiliary input; holding down Menu again switches back to the iPod (although you have to manually press Play on the remote to resume playback). During auxiliary-input playback, pressing the Play button mutes/unmutes the system’s volume. I also liked the fact that when you place a playing iPod in the Hi-Fi’s dock, the system volume ramps up gradually instead of blasting immediately. Finally, the Hi-Fi’s status light provides a good amount of feedback during use. For example, the light “blinks” green whenever the system receives a valid command from the remote control and orange when an invalid command is received—if you hold down the Menu button when there’s no source connected to the auxiliary input jack, that’s a bad command and you’ll get the orange light. But the light also glows orange if you try to use another Apple Remote that’s already paired with a different Apple device. This will be a useful feature in multi-Apple-remote households—it’s the Hi-Fi’s way of saying, “Hey, buddy, you’re using the wrong remote!” The light also tells you when iPod playback is paused (or auxiliary input muted) and when you’re running off battery vs. AC power. Home stereo redefined? Or compact stereo refined? Given the bold claims Apple has made about the Hi-Fi’s sound quality, it’s only fitting to hold its feet (foot?) to the fire, so to speak. I did just that, spending two full days sitting in front of the Hi-Fi listening to a variety of music, from 128kbps iTunes Music Store-purchased rock and pop to uncompressed and Apple Lossless-encoded classical and jazz. Before getting to my impressions, one thing I should point out is that the iPod Hi-Fi is clearly designed for “room” listening, not desktop listening; it sounds much better from a few feet away or across the room than it does sitting in front of you on your desk. I used it as a regular stereo, enjoying it from the comfort of my couch and walking around the room; if you’re looking for something for your desk, there are better options out there (see below). A few things immediately jump out at you when listening to the Hi-Fi. The first is that it has a rich, warm sound that doesn’t grate or offend like many lesser iPod speakers. The second is that despite its relatively small size, the Hi-Fi has actual bass . (Don’t let frequency-response snobs tell you that 53 Hertz—the official low-end of the Hi-Fi’s stated frequency range—isn’t “real” bass; unless you’re listening to pipe organs or putting together a home theater system, a relatively flat response down to ~50 Hertz is going to give you more bass than you’re probably used to.) Finally, the Hi-Fi can play loud . Incredibly loud, in fact, given the size of the system. Apple’s Borchers told me that when running off AC power, the Hi-Fi is capable of 108dB SPL (measured from 1 meter away) without distorting; off battery, the level is 102dB, still very loud. I was able to turn the Hi-Fi up to levels that were too loud to listen to comfortably (or safely) and the system didn’t even flinch. Put these things together and you get a system that easily fills even larger rooms with surprising sound levels—and sounds good doing it. On the other hand, my inner audiophile isn’t completely satisfied. Granted, the iPod Hi-Fi is good enough that it can reveal the differences between good and bad recordings, and between low-bit-rate and higher-quality music files; for many people, that alone will be enough. (Borchers noted that Apple’s goal was to make the Hi-Fi sound as good as possible on the widest range of music, and I think the company did a pretty good job of that.) However, the Hi-Fi isn’t perfect. Its most obvious limitation is a lack of upper treble detail that, combined with slightly elevated midrange levels, makes the very highest frequencies difficult to make out at times. For example, when listening to certain classical pieces, the attack of a harpsichord—which should be bright and precise—is slightly indistinct and overpowered by those instruments crowding the midrange frequencies. The Hi-Fi’s other limitation is that it can’t really overcome its one-piece design to provide expansive soundstage and precise stereo imaging. On well-recorded tracks, the soundstage does project slightly outside the unit itself, but not in a way that’s going to have you looking around for more speakers. For example, in Dave Brubeck’s Take Five, there’s a drum solo in which, on a higher-end system, you can clearly place the drum kit—and even drums within the kit—along a horizontal plane. On the Hi-Fi, the drum kit is correctly shifted to the left of the soundstage, but beyond that the drums are more of a single entity than a kit with distinct instruments. Granted, these are the types of minor deficiencies that many people won’t care about—or perhaps even notice. However, since Apple is advertising the Hi-Fi as an “audiophile-quality.” system, it’s only fair to give it an audiophile listen. During last Tuesday’s presentation, Apple CEO Steve Jobs said, in effect, that none of the current iPod speaker systems on the market could match the iPod Hi-Fi in terms of sound quality. Given that we have many of those systems here at Playlist , I also decided to do some proper comparative listening tests, pitting the Hi-Fi against some of the better “desktop/bookshelf” iPod speakers out there. None of them can compete with the Hi-Fi in terms of absolute volume and bass levels, but some do particular things better. Bose SoundDock ($300): The Hi-Fi provides richer sound with more room-filling presence, deeper bass, and slightly more ambience. On the other hand, the SoundDock has better treble clarity. It’s also better for near-field (close-up) listening. Who will prefer it? Those looking for something for the office desk or who prefer treble clarity. Altec Lansing inMotion iM7 ($250): Again, the Hi-Fi provides richer, fuller sound, but the difference is not as big here, especially at the low end and at higher volumes—the iM7 actually has pretty good bass response and plays quite loud. The iM7 also has better treble detail, and because it has its own treble and bass controls, you can further tailor the sound. Who will prefer it? Those looking for a bit more treble detail or who need more rugged portability. Tivoli Audio iSongBook ($330): Given the iSongBook’s much smaller speaker drivers and enclosure, it’s not surprising that the iPod Hi-Fi puts out significantly more bass and lower-midrange for (again) fuller and richer sound. However, the iSongBook provides exceptional clarity and detail that the Hi-Fi can’t match. And thanks to the iSongBook’s detachable right speaker, which can be placed up to 6 feet away from the main unit, the iSongBook provides better soundstange and imaging. Who will prefer it? Those looking for wider stereo imaging or who like the iSongBook’s additional features (radio, clock) and smaller size. ZVOX mini ($200; $300 with battery and carrying case): The Mini, which is currently in our review queue, is in many ways the closest system to the iPod Hi-Fi: Although it doesn’t include an iPod dock or remote control, it’s a one-piece, box-shaped speaker system, designed to replace a traditional bookshelf stereo, with much more presence than you would expect. Although the Hi-Fi gives you better bass, the ZVOX system provides more treble detail (perhaps too much for some people), as well as slightly better imaging and a much wider overall soundstage—more than any other one-piece system mentioned here. It’s also much smaller. Who will prefer it? People who want a bigger soundstage and more detail, or those who like the Hi-Fi but need better portability. I also compared the iPod Hi-Fi to three systems with similar pretensions—replacing a home stereo—that use separate right and left speakers. The first, Audioengine’s $349 Audioengine 5 is a set of bookshelf speakers with a built-in amplifier, ports on top for connecting and charging an iPod, and an AC outlet on the back of the left speaker for directly connecting an AirPort Express. The Audioengine 5, like most other speakers here, isn’t quite as rich and warm as the Hi-Fi, but it provides similar bass response and volume levels, better detail, and much better soundstage since you can separate the speakers. The second system is Monitor Audio’s $349 i-Deck, an iPod mini system with a built-in dock and DAC, as well as left and right speakers. The i-Deck loses out at the low end, but provides excellent clarity, soundstage, and imaging. Finally, Klipsch’s $400 iFi features separate satellites, a hefty subwoofer, and an iPod dock. The iFi is the only system that clearly bests the iPod Hi-Fi at the low end—thanks to an 8-inch sub in a large enclosure, powered by a massive amp—and it compares favorably in the mids, as well. The iFi’s most significant flaw, in fact, is similar to that of the Hi-Fi: less-than-stellar treble detail. But it does have the capability to provide better soundstaging and imaging thanks to separate speakers. On the other hand, surprisingly, the smaller Hi-Fi seemed a bit more “in control” at the loudest volumes. Of course, it’s not exactly fair to compare the all-in-one iPod Hi-Fi to these latter three systems, given that they take up more space and have wires and cables—the Audioengine 5 even requires you to buy a separate iPod dock and remote—but it’s good to know what’s out there for similar money if you’re willing to put up with separate pieces. Apple made some big claims when it introduced the iPod Hi-Fi—by calling it an “audiophile-quality” system, the company invited harsh criticism from audio geeks everywhere. Had the pitch instead been, “We don’t think anyone else has done the all-in-one iPod speaker system right, so we’re going to do it,” the public reaction probably would have been much more positive. After all, in addition to providing good sound, the Hi-Fi includes a number of clever and unique features that set it apart from systems that are simply speakers and an amplifier. And considering that Bose’s SoundDock has been selling exceptionally well at $300, a $350 price point for the Hi-Fi’s significantly better feature set along with sound quality that some people will prefer doesn’t seem all that unreasonable. And it really is in this context—compact systems—that you should consider the Hi-Fi. Although I’m sure a few iPod owners will get rid of a larger home stereo system—especially an older one—for the convenience and compact size of the Hi-Fi, I don’t see people with true high-end stereo systems trading them in. Rather, the Hi-Fi is going to be an attractive option for people looking for good, room-filling sound in a compact package: It’s a bookshelf system for the iPod generation, and one that can even be taken with you in a pinch. In fact, Apple’s Borchers put it well: In designing the iPod Hi-Fi, Apple was aiming for rich, room-filling sound in a system that could replace an amplifier, a set of bookshelf speakers, and a stack of CDs. In that respect, the Hi-Fi succeeds admirably, even though not everyone will prefer its sonic presentation to that of its competitors. And the Hi-Fi’s unique features might even win over a few fans of the latter.